The Italians are the masters of speaking with their hands: think of a taxi driver in Rome stuck in traffic or a village gossip spreading the tale of a cuckolded husband. Bruno Munari's little handbook will help you decipher this language of gestures, an unspoken language you won't find in any dictionary. Used the images from this book to wallpaper my bathroom; excellent quality. 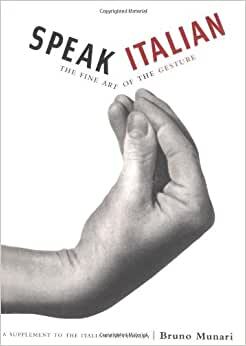 If you are insulted by gestures of others and do not understand the Italian language , this book will help you understand better what they mean and how they are saying it. It is a beautiful language and this book is small enough to fit in the purse or back pocket to carry along. Very helpful. 5.0 out of 5 starsWell received by a person of Italian descent as a gift. This proved to be a good gift after a lecture on hand gestures Italian use, and looking back I saw my mother-in-law use some of them leaving me to guess the meaning. This though did make me curious about how many regional differences exist in hand gestures.